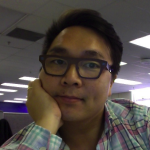 Based in Washington, D.C., Son Tran is the Agile ScrumMaster in the Office of Digital Design Innovation at the Broadcasting Board of Governors. His interests include design thinking, innovation planning, and implementing agile practices in the federal government. A graduate of Wesleyan University and Georgetown University, he enjoys city living with his husband and their two canine kids, attending clandestine supper clubs, reading, foreign languages and playing masters level lacrosse and squash. Follow him on Twitter at @sont.